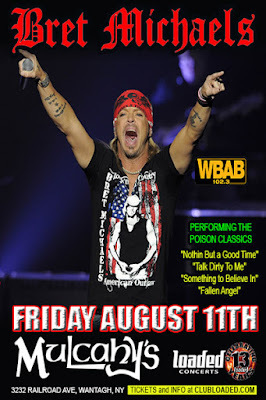 From rock icon to “Rock of Love” - this Summer Loaded Concerts and WBAB 102.3 get ready to present Bret Michaels LIVE at Mulcahy's Pub & Concert Hall (3232 Railroad Ave, Wantagh, NY 11793) on August 11. As a rock star, reality star, spokesperson, businessman, and philanthropist, Bret Michaels does more jobs in a single day than most people do in an entire lifetime. Depending on the hour of the day he's a cultural icon, a rock god, an entrepreneur, a TV star, a father, the face of the American Diabetes Association, a supercross enthusiast, solo artist, Poison frontman, and a generous donor to a myriad of charitable causes. Michaels first rose to fame as the frontman of Poison. As one of rock's most iconic and enduring bands, Poison defined the fast, gritty, and glamorous rock 'n' roll scene. Since the band's beginning, Poison has achieved massive success- releasing eight studio albums, four live albums, and selling over 30 million records worldwide and 16.5 million records in the U.S. alone. The band has charted 10 singles in the Top 40 on Billboard's Hot 100 including the number-one single "Every Rose Has It's Thorn." Twenty-five years after their debut, Poison is still recording music and performing together. Bret Michaels' solo career has been equally successful: his most recent solo album, "Custom Built," released in July of 2010, topped the charts, reaching #1 on Billboard's Hard Rock list. His current solo tour, "Get Your Rock On" is selling out arenas across the country and his forthcoming solo album of the same name will be released this summer. Michaels has achieved stunning success in the realm of reality TV as well. His "Rock of Love" television series is one of the most successful in VH1's history. VH1 and Bret Michaels teamed up again for his family-oriented 2010 docu-series "Bret Michaels: Life As I Know It." He went head to head with some of the brightest minds in business on Donald Trump's NBC hit, "Celebrity Apprentice" and went on to "Trump" the competition with his Trop-A-Rocka Snapple drink. Now, as he brings his 2017 U.S. tour to New York, you can catch him LIVE at Mulcahy’s on August 11.